The way in which we identify ourselves is the way we behave, derive our sense of self-worth, and spend the majority of our time and focus on. Identifying ourselves as an athlete can be very beneficial, however, if it is the only “hat” we wear, and if our identity is centered solely around our awards, versus the qualities that earned us those awards, this can result in serious consequences. 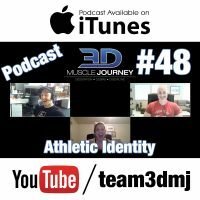 In today’s episode, Andrea, Jeff and Eric discuss both the beneficial and negative ways one can identify themselves as an athlete. Throughout the podcast, the group cover various scenarios including: How to maintain a high-level of motivation from your athletic identity while not being negatively affected by the potential downsides, losing your “prep-identity”, and solutions for those who may be identifying themselves closer to the “extreme” end. Join us this week for a valuable, uncommon conversation on, Assessing Your Athletic Identity.